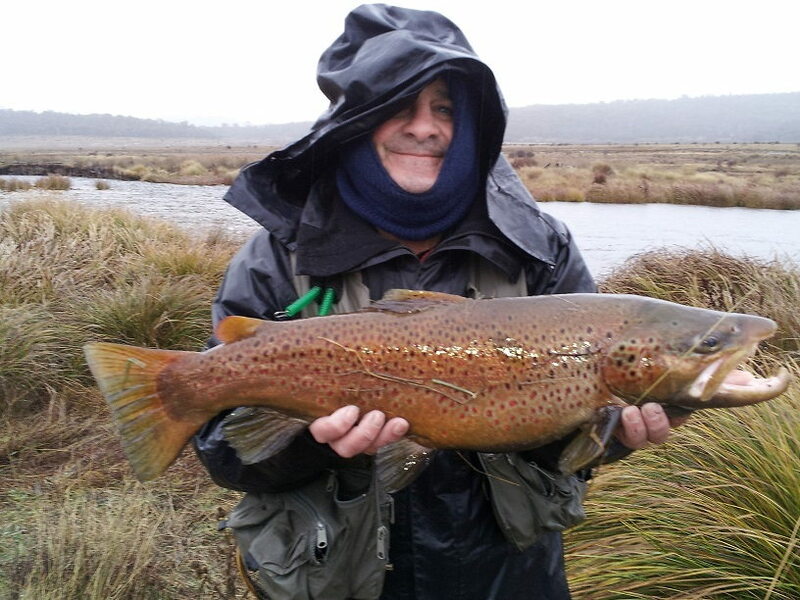 River Flyfishing....more rain more fish for the last weekend for the rivers and it’s happening big time up both rivers Eucumbene and Thredbo most fish reaching around the 8lb mark. 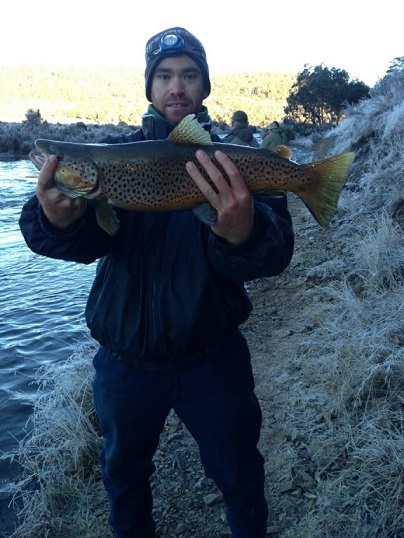 Best areas on the river is the Mouth up around the old bridge most fish are in the deep holes. 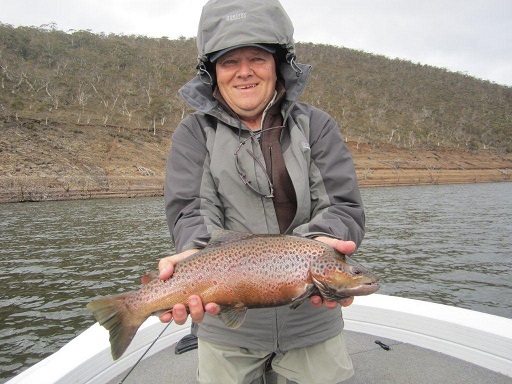 Most off the Eucumbene is fishing well so by this weekend you should start seeing fish all the way up the river now with the last rain fall on the weekend. 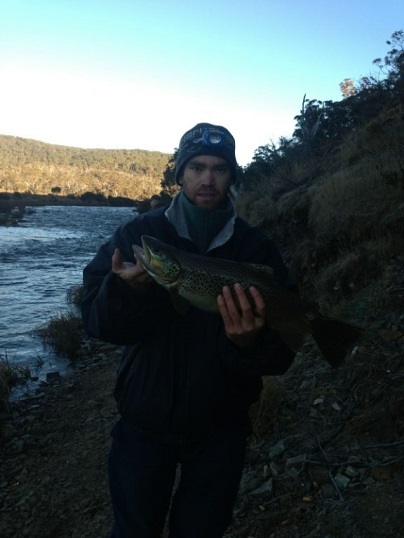 The Thredbo river is fishing well all over up and down with some good rain up high on the weekend the Browns are moving up in numbers so if you like fishing the Thredbo this is the time to be there . Up at Island bend there has been some good reports so if you want to get on to some good browns this is the place. Down around the snowy mouth the fish are still hanging around the mouth waiting for some rain to get the river flowing but if you like to walk up the river you will get some good results. Here are some photo's of Zac (my son) and Steve (hubbie), they had a great trip, caught heaps and met some great people. Ben Mahashma from Cooma with some good fish if this man can get fish anyone can!!! 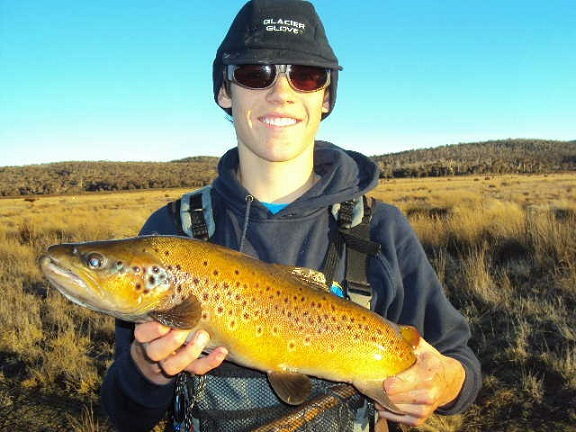 Daytime fishing has generally been the best with the evenings and night time fishing a little slow. Bead head nymphs and woolly buggers fished slow and deep have been the best fish takers of late. There have been some nice rainbows being caught for those who put a bit of time in. With the cooler weather moving in the fishing should start improving. At night time that’s if you can man up and handle the cold try a Intermediate line with a glow baby doll dropper with a large wet fly this rig is working well around deep rocky points. 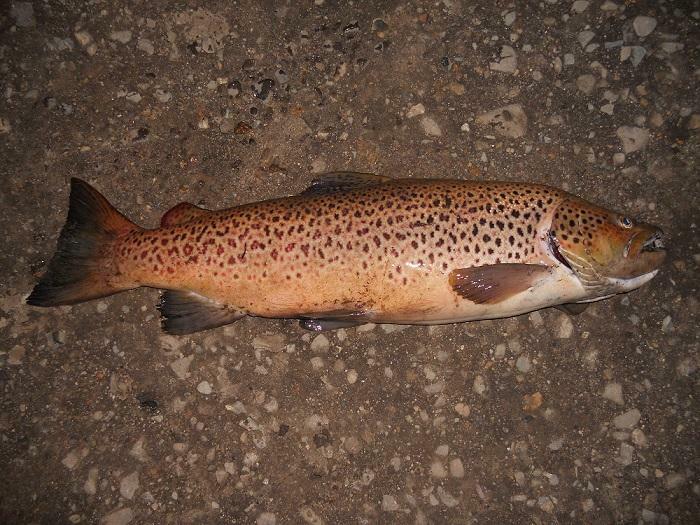 Pic attached of 9 pound Male Brown I caught in Lake Eucumbene 21/05/13 on the TCX and Lamson reel I bought from you last May, caught another last night at 8 1/2 pound and few others around 4 to 5 pounds. A mate of mine Bill ( The Burglar ) Reynolds and I came down to Eucumbene over last Friday arvo / Sat & Sunday morn .We took the boat and I have attached a fish Bill caught stripping wooly bugger / nymph combo on a sinking line in 2 metres water just off where the Eucumbene river and portal join the Lake . 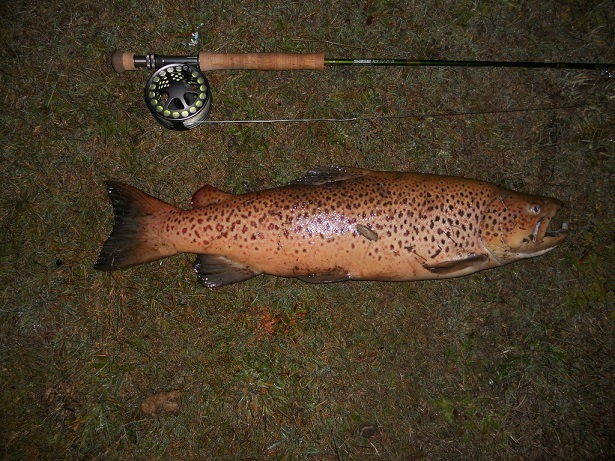 The fish was like a football ( full of roe ) and probably went 5lbs . We caught 11 fish over the trip in both the boat and walking the river . 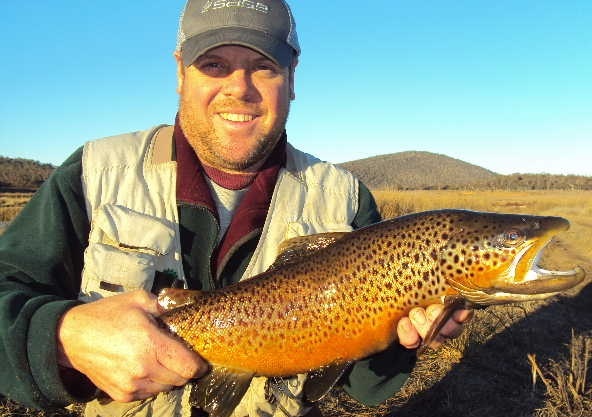 The conditions were pretty ordinary but there are plenty of fish in the river and you just need the “right fly” and make sure its on the bottom . The lake was harder and whilst most trolled , we didn’t see many fish caught . 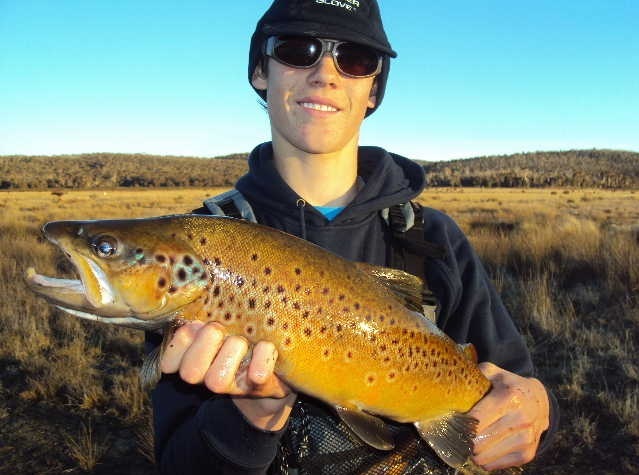 Bills a passionate fly fishing angler and on his day can match it with the young guns with his knowledge and ability to catch fish . 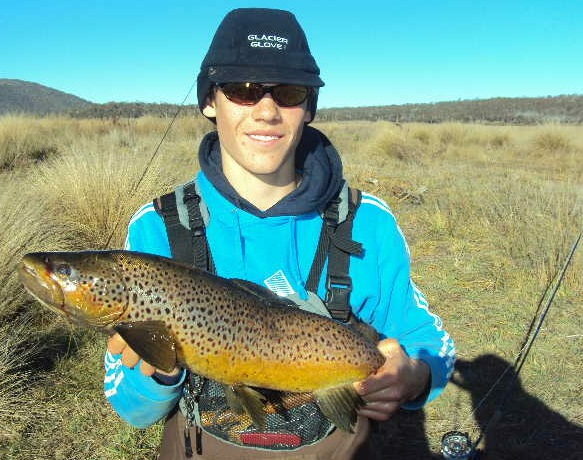 most baits are working well around Eucumbene and Jindabyne with the Power bait the stand out bait at the moment Orange, Chunky Cheece, rainbow have been getting some good rainbows. The worms are picking up some good brown on the bottom. 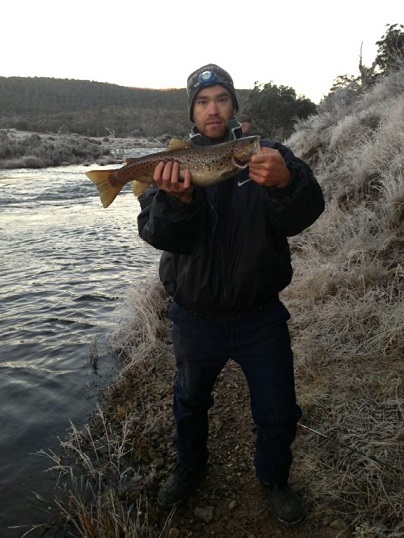 best areas on Eucumbene are Buckenderra, Seven Gates, Old Adaminaby, Anglers Reach. 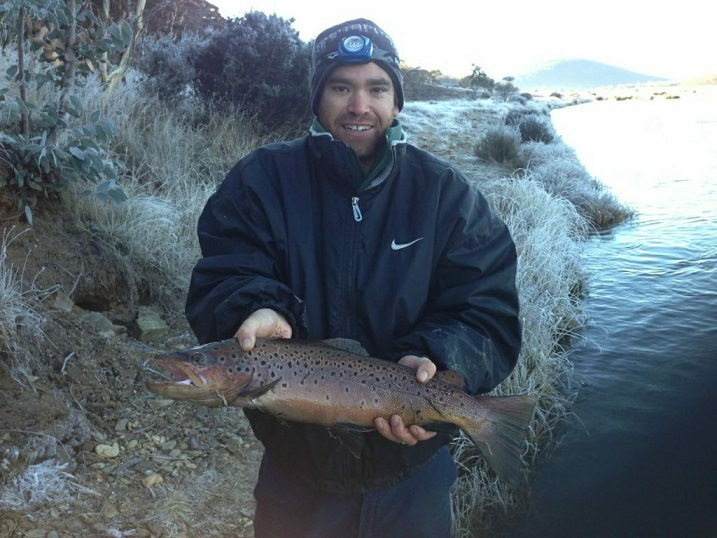 best areas on Jindabyne are poo bay,jindy east,around the snowy arm, and over at the mouth off the river jindy has been pulling out some good fish.